Back-country adventures await in the high Sierra mountains surrounding Lake Tahoe. 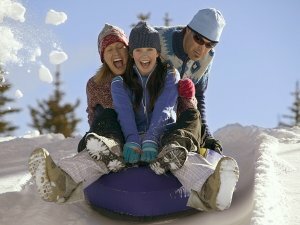 Gather the family for some tubing at Mountain High Resort. The kids get a chance to play in the snow at Mountain High Resort. Are you dreaming of a white Christmas--or a great place to play in the snow? Check into these enchanting winter retreats for a quiet winter's night. If you're looking for a place to play in the snow for the day, then you may want to head to Mt. Pinos. Usually a 45-minute drive from Magic Mountain, it becomes highly congested after heavy snowfalls and on holidays. To avoid the traffic, head out before 9:00 AM. Check with the Forest Service (661-245-3731) or CHP (1-800-427-7623) for road conditions. This quaint town is a small, traditional rural community, unlike any resort town. You won't find sushi or a spa, but there are many restaurants to choose from for casual dining. If you just want to warm up by a cozy fire and sip some coffee, check out the Coffee Cantina. Activities include cross-country skiing, snowshoeing, backcountry snowboarding & skiing, and sledding. The stargazing is said to be amazing at the top of Mt. Pinos on New Moon. You are pretty much on your own at Mt. Pinos, but you can rent cross-country skis, snowboards and snowshoes at Frazier Ski & Pack (661-245-3438) in the downtown business district. 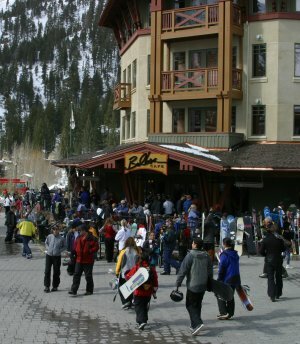 Said to be Southern California's most popular ski resort, averaging more than 500,000 visits per season. Three separate mountains offer guests a wide variety of lifts and trails, and each base area is complete with ticket windows, sport shops, rentals, restaurants, lessons and more. New this season, Mountain High introduces its third resort, the North Resort, with increased beginner terrain and the North Pole Tubing Park. Wide-open beginner areas, gladed tree skiing hideaways, challenging black diamond trails, and competitive-sized terrain features are all at the West Resort. West is home to the resort's new Children's Learning Center, the Bullwheel Bar and Grill and the Boost Mobile Music Stage where fashion shows, movie premieres and live performances are held on a regular basis. Night skiing is also available 7 nights a week from 5:00 pm to 10:00 pm and more than 85% of the resort is lit. 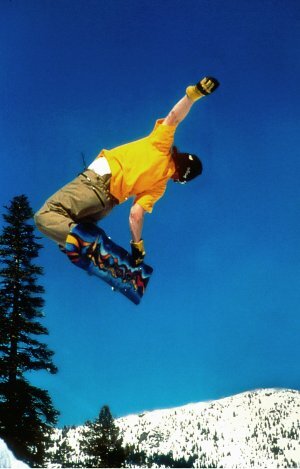 The East Resort offers the greatest vertical, serviced by a high-speed quad in Southern California. Its long, groomed cruising runs make it perfect for carving, but it is also home to the Olympic Bowl, the longest, steepest bump run in the region. The top elevation is 8,200 feet, which is comparable to the Big Bear resorts. At the top is a fun, family area encompassing roughly 20 acres, all serviced by its own quad chairlift. This mountain playground offers obstacle courses, terrain gardens and many small jumps, berms, and rollers designed to stimulate the heart as well as the head. Lodging can be found through their website. For a romantic getaway, this new historic chateau was our top choice. Originally built in 1915 as one of the many luxury homes designed in the French chateau-style, this property has undergone an extensive restoration combining the comfort and amenities of the 21st century with old-world charm. While entry-level rooms are lovely, we opted for one of the larger rooms. Guests enjoy 24-hour access to the great room of the inn, furnished in soft leather and offering board games, books and beverages. A full gourmet breakfast is included. The inn is within walking distance to the village. This great family destination sits right on the edge of Lake Arrowhead Village with private lake access. While there may be newer lodging options in Lake Arrowhead, the spa and fitness center will certainly draw you to return time and again for renewal. One of our favorite memories is sitting by the crackling fire in the lobby while enjoying a cup of hot apple cider. We didn't have an opportunity to try the restaurant at the resort, but we can highly recommend three incredible dining experiences. For breakfast, the Belgian Waffle Works (dockside at Lake Arrowhead Village) is a must. You'll want to arrive before 9:00 am, as this is THE place to enjoy breakfast in Lake Arrowhead. Fusion in the Village offered an exquisite menu they called "Euro-Asian," and Avanti's in Sky Forest served delicious Northern Italian cuisine. We were very impressed by all three establishments and interviewed folks around us for unbiased opinions. They all came up the same, "thumbs up!" 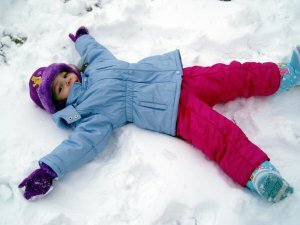 Activities include downhill and cross-country skiing, snowboarding, snowshoeing, sledding, tubing, ice skating, hiking, fishing and MSAS (Mountain Skies Astronomy Society) offers a free brochure for the serious stargazer. You'll learn about the fascinating history of the lake and the occupants of the exquisite lakefront homes. The Skate-by-the Lake outdoor ice rink is open through the Holidays and open ice skating sessions are available at The Ice Castle Olympic Training Center. We've been told this is the nicest hotel on the mountain. Designed with the theme of a 1930s mountain sports lodge, the style is carried through from the huge river rock fireplace in the lobby to the guest rooms, with custom-designed rustic furnishings and decorations designed and built by local artisan Stanley Marshall. Located in the heart of the village, you can park your car and walk to everything from skiing to shopping. The heated pool and spa are available year round, as well as the sauna and exercise facilities. The resort recommends Elevations, a day spa for those whose vacation is not complete without a massage. In addition to the unique menu offered by Stillwells, excellent dining is available within walking distance. This resort is a great choice for families or couples seeking a romantic getaway. Activities include cross-country and downhill skiing, snowshoeing, snowboarding, sledding, tubing, and horseback riding. Of course, just playing in the snow is available, too. Don't miss the Moonridge Animal Park, home to many orphaned and injured wildlife, including three grizzly bears. As the mercury in the thermometer drops, so do the rates at the park's Wuksachi Lodge. Opened in 1999, this rustic, yet elegant, motel-styled structure offers all the modern amenities. Yet, within a few steps of your room you will access a network of hiking, snowshoeing, and cross-country ski trails. Walk through The Giant Forest, home to 8,000 enormous Sequoia trees including the General Sherman Tree standing at 274.9 feet with a circumference at ground level of 102.6 feet! The two-mile, two-hour loop is an easy trail and an awesome snowshoeing experience for everyone. The newest addition to Mammoth Mountain properties is The Village, aptly named for the cobblestone walkways connecting visitors to shopping, dining and entertainment from their condo lodging. Activities available include cross-country and downhill skiing, snow shoeing, snowboarding and snowmobile adventures. Kids ages 6 and older can have fun on small-scale Ski Doo mobiles. Also ask about their sister properties. While the rest of California is heading to Mammoth Lakes, why not pass it up and head on down the road to June Lake, home to the Double Eagle Resort & Spa? Here you will find a world-class spa that integrates the tranquility of a rustic retreat with state-of-the-art facilities. You'll be amazed at the incredible beauty of the surrounding landscape, the warm and well-appointed cabins, and the activities available to you and your family. This is where you'll find that 'secluded cabin in the wilderness' feeling. New lodging facilities also opened in 2005. Enjoy winter activities by day followed by dinner in the Eagle's Landing Restaurant and a hot stone massage at the spa. Then cuddle up together in front of the wood-burning fireplace in your cabin, pop some popcorn and share stories, making new memories for the years to come. 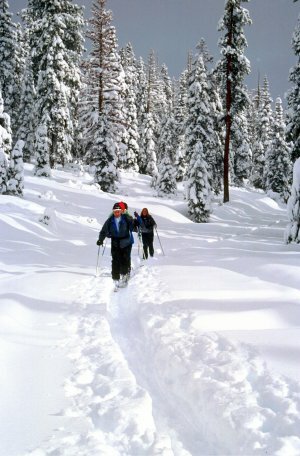 Activities available include cross-country and downhill skiing, snowshoeing, snowboarding, snow mobile adventures, ice skating, dog sledding, ice climbing, mountaineering, sledding, tubing, and fishing. Three times a season the Double Eagle offers a unique Moonlight Guided Snow Shoe Hike. 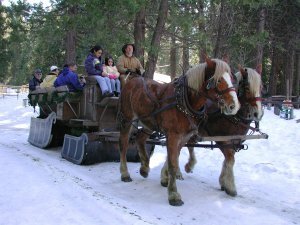 Or, if you have a quieter visit in mind, simply play in the snow, build a snowman, drive around Mono Lake and view the unique Tufas, soak in a natural hot spring, photograph the Eastern Sierras in Winter, visit Bodie Ghost Town (snow transportation required*), or enjoy the outstanding star gazing opportunities. *Four-wheel drive vehicles will not get through to Bodie in the winter months. If you're staying in the area but not at the Double Eagle, you can still purchase a Day Pass to partake in many of the Double Eagle's activities. Daily use fees are waived for those scheduling spa appointments. AAA has granted this resort their prestigious Four Diamond Award for good reason, and in 2007 it completed a $3 million renovation. Nestled in the wilderness of the High Sierras, The Tenaya Lodge will delight all of your senses. Top off your day of winter adventures with an exquisitely crafted meal in the Sierra Restaurant or share the day's memories around the towering fireplace in the grand lobby. Venture into Yosemite by day and enjoy lunch at the Ahwahnee Hotel, often described as the most beautiful restaurant in America. Or, ask the Tenaya staff to pack a delicious picnic lunch for your trip into the park. 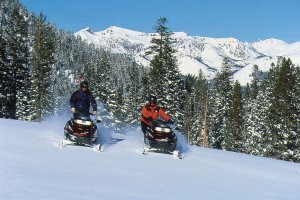 Activities available include cross-country and downhill skiing, snow shoeing, snowboarding, snow mobile adventures, ice skating, sleigh rides, mountaineering, horseback riding, sledding, tubing, fishing, and hiking in Yosemite National Park. 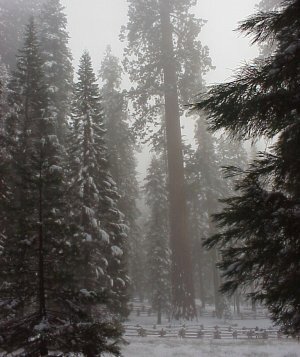 You can even stroll through the giant trees of Mariposa Grove. Don't miss the Tenaya's flashlight tour or Yosemite's free photography walks by the Ansel Adams Gallery staff. Stargazing from Glacier Point in Yosemite is spectacular and a favorite pastime of Yosemite visitors. Or, just cuddle up and enjoy the indoor pool, whirlpool, fitness center and spa services after building your own snowman. Head to the slopes with the Olympians in beautiful Squaw Valley, just ten minutes outside of North Lake Tahoe. Often referred to as "Olympic Valley," this was the site of the 1960 Winter Olympic Games and claims to be #1 of all Lake Tahoe ski resorts. You'll find thousands of acres for open bowl skiing, the KT-22 hailed as "the best chairlift in North America" in an article in SKIING Magazine's Sept. 2004 issue. The mountain receives an annual average snowfall of 450'. Activities in the area include skiing, snowboarding, snowtubing, night skiing and snowboarding, cross country skiing, snowshoeing, ice skating, sledding, dog sled tours, snow mobiling, and sleigh rides. Swimming, soaking in a hot tub or visiting the spa may be the perfect cure for those sore muscles. Visit the Olympic history museum, go wall climbing or sky jumping, sit around an outdoor fire, shop in the village or at the resort, cozy up by the fireplace in your condo and order takeout, or enjoy pizza and beer at Fireside Pizza. The Village at Squaw Creek provides a homey atmosphere with condo-style luxury accommodations and underground parking. The South Shore is a cluster of lodgings, restaurants, shopping centers, casinos, and businesses at the ready to serve tourists. Think Vegas, lakeside and set among conifers. The south shore receives an annual snowfall of ten feet, and at least 25 feet falls every year at alpine level, providing exceptional downhill ski conditions. Downhill skiing, snowmobiling, dog sled expeditions, sleigh rides, snowboarding, snowshoeing, tubing, cross-country skiing, ice fishing, and ice skating are all available. Top the day off with a luxurious spa treatment, indulgent dinner, or a movie in Heavenly's new 8-plex theatre. There are many resorts to choose from including the new Heavenly Village's Marriott Grand Residence Club, Embassy Suites Hotel Lake Tahoe Resort, and Lakeland Village Beach & Mountain Resort. Please check with the concierge at your destination or the CHP hotline ((1-800-427-7623)) before setting out. Due to weather conditions, some roads may be impassible and activities may not be available. Be certain to bring tire chains or a vehicle equipped with studded tires, which may be necessary even with a 4-wheel drive vehicle. It is also possible that snow will not have fallen at your destination of choice. Call ahead so you will not be disappointed.